When we saw the Aladdin Mexican grocery store at the corner of Wallace and Glen Creek had a sign out front saying they now served tacos, we were thrilled. 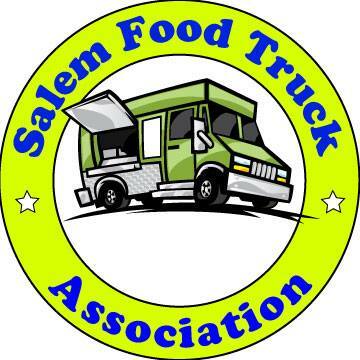 We have no taco trucks or taco stands in West Salem, and sometimes, it really is too much effort to go "into town," as we West Salemites call crossing the bridge. We have visited Aladdin's on occasion for some of our favorite bakery items and meat and have always been impressed with both the goods as well as their customer service. So, we turned the car around and pulled up to Ricos. Ricos really is just a grill outside, with a table and chairs set in the middle of one of the parking spaces. She takes cash, but you can also use your debit/credit card inside and bring her the receipt. 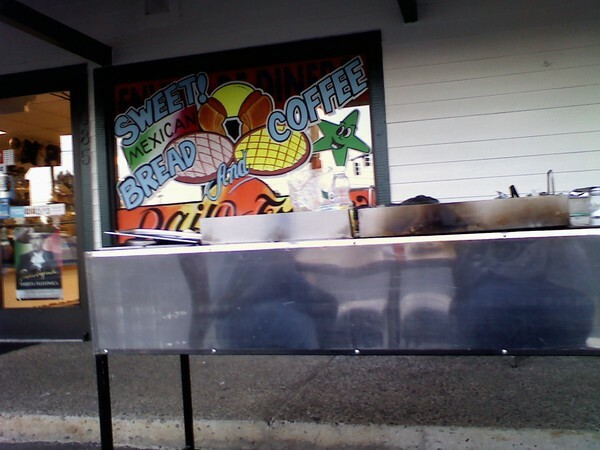 Unlike a taco truck, there were limited options, given the size of the operation, with only tacos on the menu. 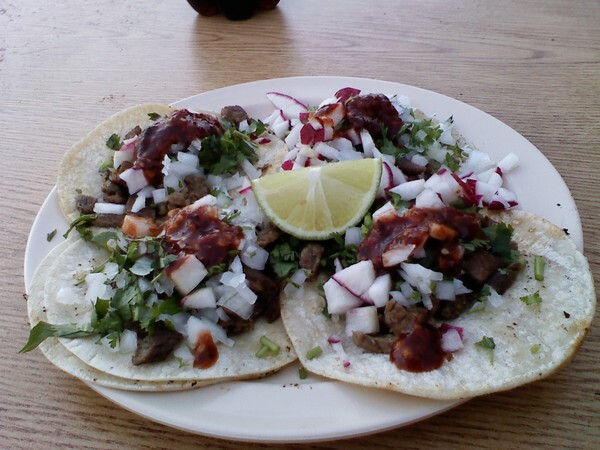 She offers carne asada, pollo asada, lengua, and carne adobado as meat options. To top your taco, you have the choice of red onion, cilantro, spicy red salsa and lime. We ordered a combination of carne asada and pollo adada with all the toppings and settle down at the table to wait with the Jarritos sodas we purchased in the store when we paid for our tacos. She brought us our tacos which were generously filled with a nice wedge of lime, in my book a necessity for tacos. Now, my husband, a connoisseur of tacos, has a saying to describe the "goodness" level of taco stand/truck tacos. 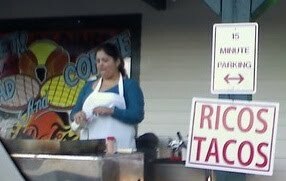 They are either A) Good tacos for 50 cents or B) Good 50 cent tacos. Yes, the difference is subtle and may be hard to recognize, but description A indicates that they good tacos and they only cost 50 cents. Description B indicates they are good tacos, but you get what you pay for. Although these tacos were actually $1.00 a piece, we both agreed they fell into category A. They were really good $1.00 tacos. The meat was well seasoned, the tortillas soft and pliable, and the toppings were fresh. We will definitely be back, the only bummer? Limited hours, confined to the weekends. Those tacos look great! Thanks for posting this. I really miss authentic tacos after spending extended periods in la paz. Lunch! 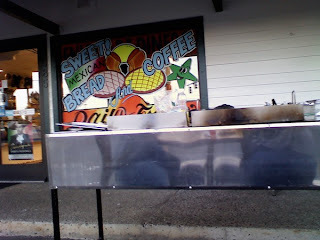 I know they're supposed to be open Fri, Sat and Sun only, but I stopped by today (Wed) at about 4:30 PM and there she was with the griddle hot. My bride had dinner plans for me at home shortly, so I just had one lonely Carne Asada Taco, just to sample the quality. I sat down at one of two tables set up in the parking lot and dug in. It was delicious. Much reminiscent of a couple of local taco trucks which introduced me to Carne Asada years ago. Check 'em out. They're REALLY GOOD! Can't wait to go back hungry and try their other offerings.